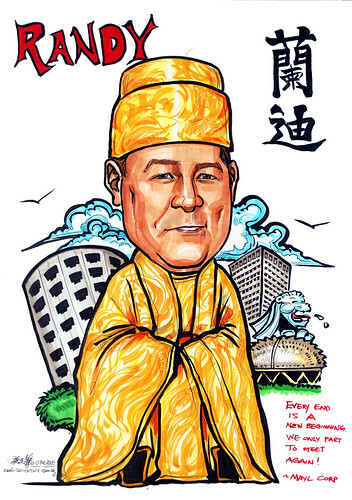 "We would like him to be in Chinese Emperor costume and the background is Fairmont Hotel, Orchard Towers, Esplanade and Merlion. If possible, Fairmont Hotel is more prominent than the others. "Every end is a new beginning, we only part to meet again. - MAYL Corp"
We also like both his English and Chinese names to be in the drawing. Do not include his spectacles in the caricature. Attached is the picture of the Chinese Emperor costume that you could pattern after to...."
Initially, I was thinking of using my son's Trio marker to create the pattern of the Emperor's costume as in , as provided by teh client. Unfortunately, the colours don't go with what I wanted. Thus, I have to switch back to my Copic markers. Overall, it still looks good to me. In fact, I am satisfied with it!